5-4 BC • Escape to Egypt. Slaughter of children. 4 BC • Herod the Great dies (spring). 7-8 AD • Jesus visits Jerusalem as a child. 12 AD • Augustus makes Tiberius co-regent. 14 AD • Tiberius becomes Caesar (August 19th). 25 AD • Pilate & Caiaphas appointed to office. 29 AD • Ministry of John the Baptist begins. 29 AD • Christ’s ministry begins. 31 AD • Tiberius executes Sejanus (Oct 18th). 33 AD • Jesus dies (Friday, April 3rd, 3:00pm). 36 AD • Pilate dethroned. Caiaphas deposed. 37 AD • Tiberius Caesar dies. Spirit Filled Person to world– Where do you see your Spirit Filled Persons influence in the world today eg: through the actions of others. Saint to world– Where do you see your Saints influence in the world today eg: through the actions of others, St Francis looked after animals PETA looks after animals today, St Angela patron of the sick. Choose two gifts of the Holy Spirit and explain how your chosen Saint used these gifts in their life. Choose two fruits of the Holy Spirit and explain how you chosen Saint displayed this fruits in their life. Explain why you chose this particular Saint and how it will impact your life in the future. Complete by week 9 to present in week 9 to a small group. What is Pentecost? This is a very special time in the Bible when the disciples and other Christians received the Holy Spirit. Before I explain why and how this happened there’s a few things you need to know first. God didn’t just pick any day for this to happen. Like everything God does, he has a specific time, purpose and reason for it and Pentecost was no exception. Pentecost occurred 50 days after Easter Sunday or 50 days after Jesus rose from the dead. Jesus had already gone back to Heaven so the disciples and new believers of Jesus were waiting to receive the Holy Spirit because that’s what Jesus told them would happen. Plus, since Jesus wasn’t with them any more the Holy Spirit would help bring them closer to God. Just before Jesus was taken up to heaven he told them that they would receive power when the Holy Spirit comes on them and they’d be his witnesses in the whole world (Acts 1:8). Even more, he told them much earlier that the counselor (or Holy Spirit) would be sent by the Father, that He would teach them all things and remind them of everything he said to them (John14:26). So, the Holy Spirit is super helpful to us! He becomes a part of us when we become a Christian and understand that Jesus died and rose for us. When we’re ready to try to live a life pleasing to God the Holy Spirit becomes part of us so we have a part of God with us all the time. The day of Pentecost was a bit different though. People had already become Christians but the Holy Spirit wasn’t a part of them yet. This would be the first time everyone who was a Christian would receive the Holy Spirit. The disciples and other Christians had come together to thank God and suddenly a sound like the blowing of a strong wind came from heaven and filled the whole house where they were sitting. I have a feeling the windows weren’t open either! Next they saw tongues of fire that separated and came to rest of each of them. I’m not sure if they could see the tongues of fire or if it’s how the people could explain what they felt happening. When the tongues of fire came they were filled with the Holy Spirit and began speaking in different languages. It was no surprise that the crowd that had gathered to check out what was happening thought that there wasn’t something special happening, after all they weren’t there when the Holy Spirit came to them. So some of the crowd started making fun of them and started to think that they had too much wine and it was making them act funny. When Peter started to hear these rumors he raised his voice and talked to the crowd. He explained that they weren’t drinking wine because it was only nine in the morning (people usually drink orange juice or coffee that early in the morning). Plus, the people celebrating Pentecost didn’t eat or drink till at least ten in the morning. He explained that Joel, a messenger of God’s word said that this very thing would happen a long time ago. God usually would tell a prophet when something important was going to happen way before it actually happened. Just like the Bible told us a Savior (Jesus) was going to come and save us long before Jesus was even born. Peter explained that they should repent (say they’re sorry and stop doing bad things) and be baptized so that others would know that they believed in God and were trying to change. 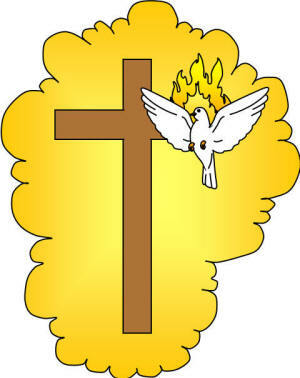 Now, because of Jesus death and his resurrection people could be forgiven and receive the Holy Spirit from now on. The Holy Spirit actually helps us in many ways, he comforts, teaches, helps us grow in our relationship with God and gives us strength to get rid of the bad habits in our lives. He also gives us power and helps us know when we’ve done something wrong. Of course, we need to want to grow, learn and change to be more like God for the Holy Spirit to really work with us. L.O- We are investigating the infancy narratives and how it has been portrayed in many ways such as books, video and songs. Click the infancy-narratives to read the scripture passage from the Bible. The Earth Stood Still from scott zibell on Vimeo. Scripture sites where Jesus is teaching about how to live. L.O- We are learning about the writer’s of the Gospel. Click HERE for an online bible. Choose one of the Gospels and read some of the scriptures about the teachings of Jesus. Read the stories that you can relate to in your own life and present a modern day interpretation. What are some of the learnings Jesus wanted for his community? How can you relate to the teachings today? Give some examples. What connections can you make to your own experiences, feelings and beliefs? Choose a story by your author and link it to your Big Idea. Using Wordle cut and paste a scripture you were using and see what words are most used. What significant events was this person involved in? What other people were involved? What kind of choices did this person have to make? What were the consequences of these choices? Did this situation affect his/her relationship with God? What were the strengths and weaknesses of this person? Why did this person teach you and others? ONLINE BIBLE– Click the Text to use a Bible. Click on the link below and have a look at the photos, choose 3 and write why you think these photos show dignity. Look through the Gospel of Mark and choose a story where Jesus is helping those less fortunate. What is the message in the story? What can we learn from this story about how to live our lives today? Go and sell whatever you have and come follow me. Moses’ story is found in Exodus. He was a very important person in the Bible for both Jewish and Christian traditions. What was the significance of Moses? What did he do to help his people? Why do you think he was chosen? Who are the sacred people, and what are the stories in our Christian tradition that impact on our faith today? Who Is In The Bible? KWL, 2nd edn, Year 6, Chapter 10, pp. 91–93. Moses, Sarah, Elizabeth, Paul, Peter, James, Martha, King David, Noah, Rachael, Joseph, Jacob, Abraham, Isaac, Rebecca. What significant event was this character involved in? What other characters were involved? What kind of choices did this character have to make? How did this situation affect his/her relationship with God? What were the strengths and weaknesses of this character? Would this character be admired in today’s world? Session 1) Grade 6 –Click and fill out the padlet wall. L.O- We are learning to find characteristics of the Good Samaritan in people today. – Is there a person in your life, community, world that has been like the Good Samaritan. How did this person display the qualities of the Good Samaritan? Write a story about someone inspiring in your community. L.O- We are learning about the significance of the life Jesus and how he has impacted on our lives. During Holy Week what did Jesus do to make him memorable? Task- Students will get into groups of four. Each student will choose a day to be the expert. On Monday a teacher will lead a workshop focused on your special event. Mr Dando- Getting ready for liturgy. L.O – WAL about the importance of Advent and Christmas for Christians. Why are Advent and Christmas important seasons for Christians? How will you show your understanding? Faith has played a major part in the establishment of Australian society. Without their faith, the earliest settlers would have packed up their tools and gone back to England after experiencing the harshness of the Australian landscape. Religious Orders and important faith filled people have supported Australians since these times. Investigate some of the important Religious and secular Orders and faith filled people who have helped support the faith lives of Australian Catholics over the past 200 years. Choose one of the following orders, read about them, answer some key questions and share your learning with the group. Who founded the Order? When? What was special about the founder of this order? When Pentecost day came round, the apostles had all met in one room, when suddenly they heard what sounded like a powerful wind from heaven, the noise of which filled the entire house in which they were sitting; and something appeared to them that seemed like tongues of fire; these separated and came to rest on the head of each of them. They were all filled with the Holy Spirit, and began to speak foreign languages as the Spirit gave them the gift of speech. In the evening of the first day of the week, the doors were closed in the room where the disciples were, for fear of the Jews. Jesus came and stood among them. He said to them, ‘Peace be with you,’ and showed them his hands and his side. The disciples were filled with joy when they saw the Lord, and he said to them again, ‘Peace be with you. Look at Christian role models or groups. Examine the vocation of these people who build the church today or have contributed to it in the past through their gifts of their words and actions. Examples of Christian role models are: St Vincent de Paul, Maximilian Kolbe, Weary Dunlop, Moira Kelly, Sacred Heart Mission, Young Vinnies. 1) Why do/did they do what they do? 2) Why are they good role models of people who take their vocation seriously? 3) What gifts and fruits of the Holy Spirit do they show? Why/How? 4) Is there any other information you would like to add? What is your Saints feast day? How did they become a Saint? What did they do to become a Saint? What is your Saint a patron for? What qualities did they show? What miracles did they perform? How does this Saint make you want to be a better person? How does this Saint inspire you? What is the sacrament of ….. ? What are the origins of this sacrament? Why do catholics celebrate this sacrament? What symbols, signs and rituals are used in this sacrament? Compare the catholic practise of this sacrament to other religions and cultures. Following the Beatitudes means making the choice to put God before everything else. What do the Beatitudes mean for us today? Here are Jesus’ teachings on true happiness as they might be understood by people your age. Depend on God. Don’t let material things get in the way of loving God and others. Share other people’s sorrows and joys. Don’t set yourself apart from others. Learn to be gentle with people and things. Don’t try to get your way by violence or bullying. Work hard to make sure that all people are treated justly. Do what you can to change unjust conditions. Forgive others and ask their forgiveness. Let compassion, not anger, rule your life. Turn your attention only toward what is good and right. Be faithful to God and God’s ways. Work to bring people together. Don’t contribute to quarrels and fights. Look for ways to solve problems peacefully. In difficult times, keep trusting in God and standing up for what is right. When did she/he become a Saint? What they did that helped the community? What Fruits and Gifts do they have and how did they show them? How are they a role model? The tale of Jesus makes me think about how nobody really knows if its all true or its just a fairy tale.